I spent a lovely afternoon exploring some of the best that gluten free Edinburgh has to offer. Along with three of my friends, we started with a lovely brunch, then visited a local market before taking a beautiful stroll along the Water of Leith. We finished with gluten free treats at Sugar Daddy’s and The Marshmallow Lady. 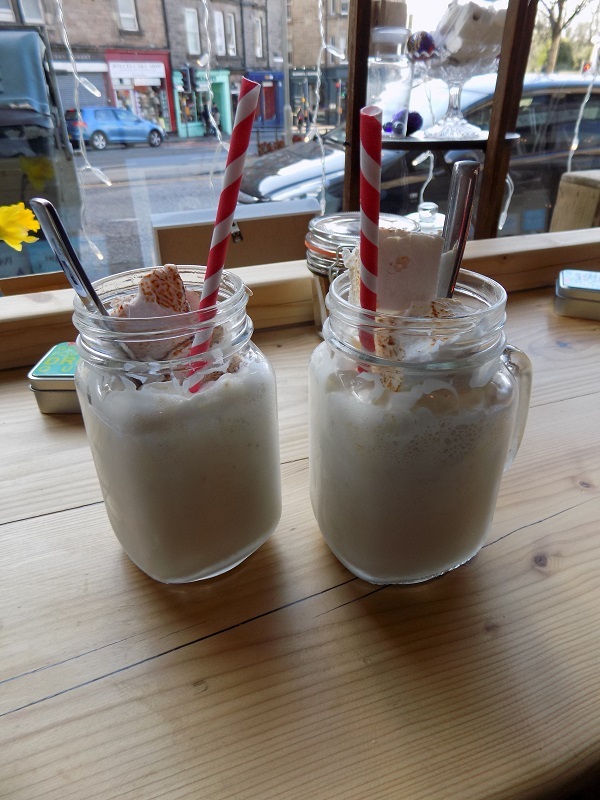 Here’s what to do in gluten free Edinburgh! We had brunch around noon at Leo’s Beanery. It’s a charming little café that does nice breakfasts and lots of sandwiches too. They offer gluten free bread and bagels, so most of the menu is doable with modifications. I opted for a gluten free bagel topped with avocado, cream cheese, tomato and pesto to which I added bacon. The bagel wasn’t dense and chewy like you’d expect; rather, it was light and fluffy, like a bagel-shaped roll. It was really good, and the combination of flavors really hit the spot. I also had a very good latte there. After brunch we walked along to the Stockbridge Market, held on Saunders Street every Sunday from 10-5. It was packed with people, so I didn’t get as close a look as I wanted to, but I did notice a few gluten free treasures. Gluten free macarons: Mademoiselle Macaron is selling these delightful treats made from almond flour at the market, and all but one flavor (the beer one) are gluten free. 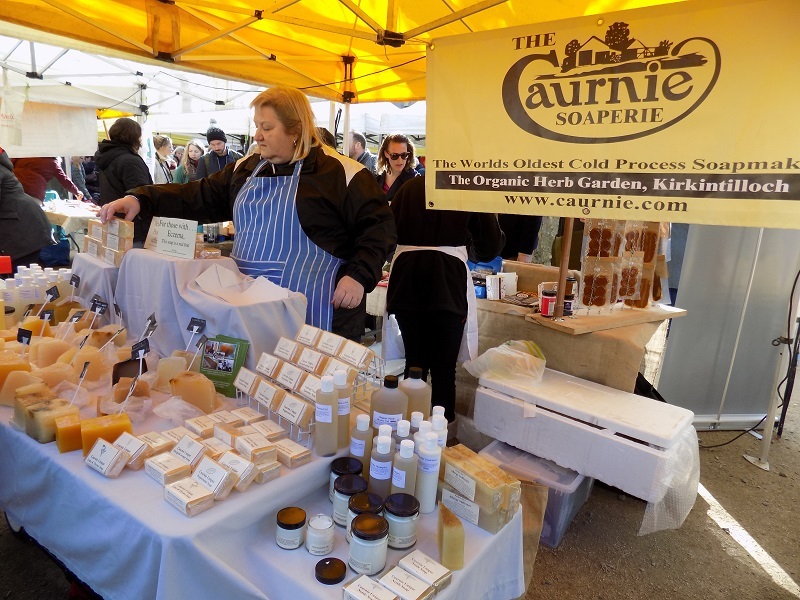 I tried a few flavors – my favorites were the lemon and the salted caramel. They’ve also got a café in Edinburgh. Arepas: I couldn’t get close enough through all the crowd to get the official name of the booth, but there was a stand selling arepas with an array of fillings. Arepas are tasty corn pockets that are eaten filled with meat or vegetables. It smelled so good, I almost regretted the delicious brunch we’d just eaten. Gluten free dog biscuits: Again, didn’t catch the name, but there was a stall selling gluten free artisan dog biscuits. If your dog is a celiac, they’ve got you covered! 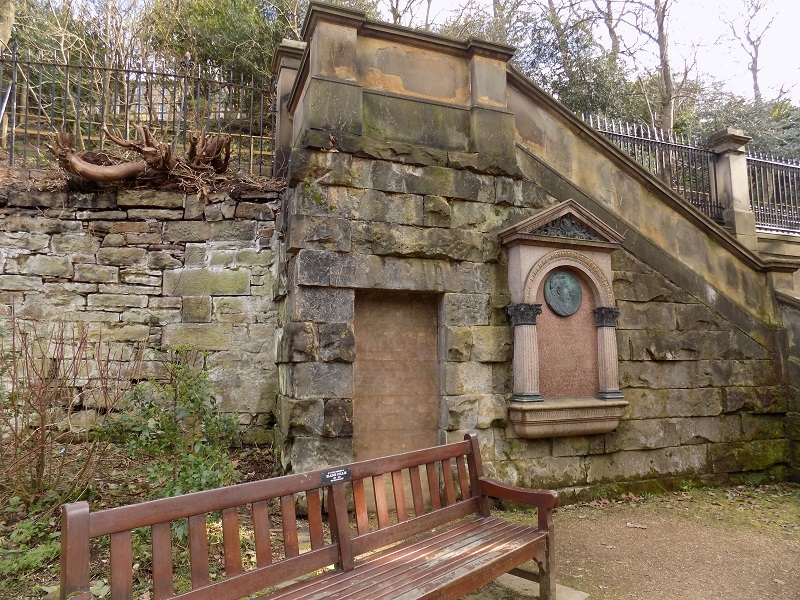 The Water of Leith is a river that runs through parts of Edinburgh with a walkway alongside it. When you’re on the walkway, you don’t feel like you’re in a big city anymore; it’s lovely and peaceful. It reminded me of Glasgow’s Kelvin Walkway. We walked quite a ways along the river just chatting. We were incredibly fortunate to have planned our adventure on a day that turned out to be brilliantly sunny and almost warm. Rocky Road bar. I may have eaten part of it before I remembered to take the picture. We left the walkway along the Water of Leith so we could visit a few gluten free shops in one small area. Sugar Daddy’s: this is an entirely gluten free bakery. It was so thrilling to walk in and be able to order anything in the display case. 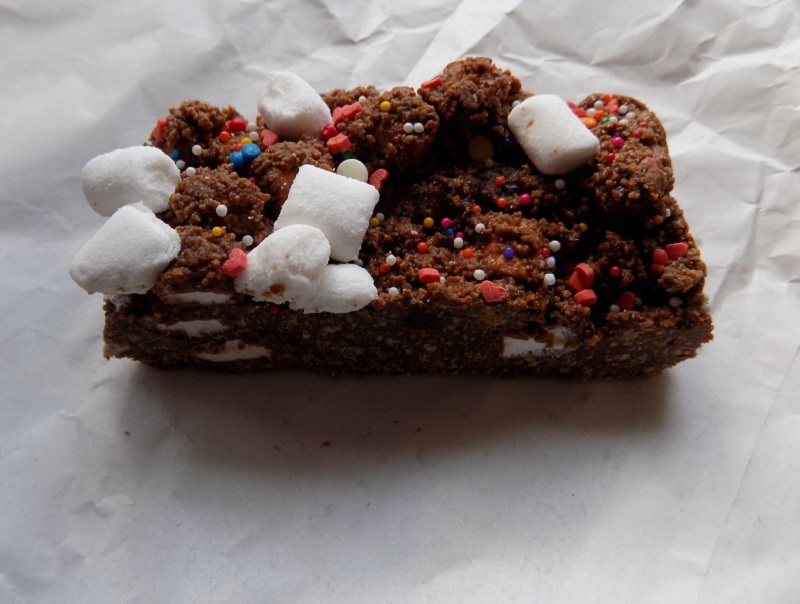 I ended up with a rocky road bar that was kind of like a brownie but with lots of marshmallows. It was really sweet and delightful. In addition to their daily supply of treats, you can order custom cakes. They can accommodate dairy free and vegan requirements and say they “love a challenge” when it comes to any other particular requirements or allergies. World-famous milkshakes. Pretty worth the hype! The Marshmallow Lady: this little shop makes artisan marshmallows, and most of them are gluten free. Additionally, they do milkshakes that achieved international fame due to a Buzzfeed feature. Having been tagged in a Facebook post by an American friend who saw the Buzzfeed article, I made it my mission to go try the milkshake. Mission accomplished. It was really good too. The Marshmallow Lady store is usually closed on Sundays because they sell at the Stockbridge Market, but this Sunday they were open (and at the market.) Sadly you can’t get milkshakes at the market, but the After Eight marshmallows are a pretty good consolation prize. After the rocky road bar and vanilla milkshake, it was time to catch my train back to Glasgow in a cloud of sugar and sunshine. It was pretty much a perfect day in gluten free Edinburgh.